Our college is maintaining a green campus with a great variety of plants.The college has a total of over 4000 plants with 171 trees, 1037 shrubs, 820 foliage, 1037 winter ornamental plants, 350 summer ornamental plants, 13 hanging baskets, 251 bulbous plants, 86 cacti and succulents and large number of weeds. An inventory of all these plants is maintained by garden committee. No tree is cut unless it becomes dead. Moreover, every year we try to plant new trees. The faculty of Botany Department indentified the different trees of the college campus and numbered the trees and put labels with botanical names and common names of these trees. In the Delhi University Annual Flower Show Zakir Husain Delhi College was awarded second prize for this effort. Our college is maintaining two Rose Gardens , a Rock garden and a Herbal Garden. Our Herbal garden was awarded Meenakshi Gopinath Trophy for three consecutive years (2014 to 2016 ) in Delhi University Annual Flower Show. 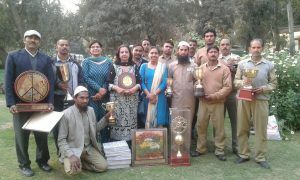 Every year our college is awarded prizes because of the green initiative by teachers , malis and students.In 2016 Delhi University Flower Show our college won 171 prizes and 10 trophies. We are proud to say that this is the largest number of prizes won by any Institute in the Flower Show.